In this podcast Ryan Phillips, a Technical Account Manager (TAM) in the Microsoft Online Services Division, will discuss how Office 365 can be used, in concert with certain applications, components, etc. to properly scope, plan, deploy and use Synchronization and Single Sign-On (SSO) services to provide end-users with the best login and usage experience. Ryan will discuss specifics around Directory Synchronization, Active Directory Federation Services (ADFS), differences between Online (Managed) users versus Federated Users and how end-users will experience sign-on into Office 365 services, such as the Microsoft Online Portal (MPO), SharePoint Online (SPO), Exchange Online (EXO) and other services. You’ll also learn about the new version of DirSync coming soon that will allow password synchronization from a local network to Office 365! 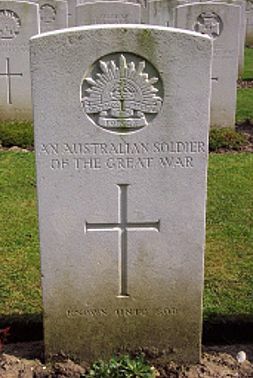 On every April 25 Australians and New Zealanders pause to remember those who have served their country. Some have paid the ultimate price, while others continue to bear the scars. To them and those that continue to serve our nations and put their themselves in harms ways we simply say – Thank You. as a great way to appreciate the major contribution these troops made to the war on the western front. Additional storage for Small Business plans is not yet available. Additional storage for Midsize Business plans is not yet available. Problem for the reseller is that their customer needed greater space than the default and being told that it could be added went down the M plan route for the customer because of the cost savings over an E3 plan. 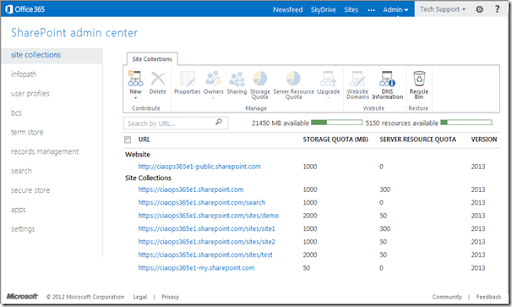 Trouble is now that they need the additional SharePoint space and it can’t be added ‘yet’. That didn’t sit well with the customer or the reseller as the only option available with the space is an E3 plan and migrating from an M plan is not a simple upgrade of plans. I am seeing a lot of confusion around what each plan does and doesn’t include. My recommendation is always E plans due to their flexibility. I would also recommend that if you go with either P or M plans check VERY carefully as to whether it exactly fits your needs now and into the future. Don’t rely on someone else, check it for yourself to avoid situation like the above. The CIAOPS podcast has now reached a milestone, 50 episodes! Who would have ever thought? And for such a special occasion we need to have a special guest and we have, SBS Diva Susan Bradley joins us again. Susan speaks about the challenges of compliance with technology and especially in the new world of cloud computing. Don’t forget all the other previous 49 podcasts at http://ciaops.podbean.com and appreciate a like over at http://www.facebook.com/n2kpodcast. AND As these guys are good too, great organization… recent papers on top security threats..
One of the misconceptions I see is that people believe you need to assign every Office 365 user a license. 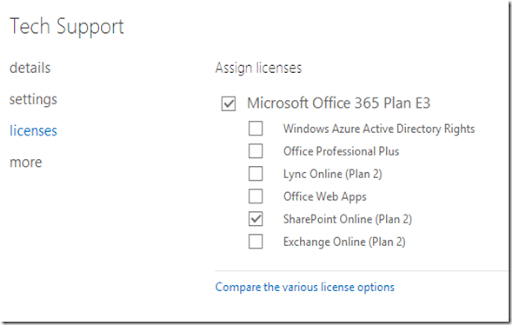 It has been best practice to create an Office 365 global administrator assign them no license and then use that user to configure and manage Office 365. You can create as many of these ‘admin’ users as you want generally as they don’t consume a license. I just tried that with the latest version of Office 365. So I created a user called Tech Support and made them a global admin as shown above. I then didn’t assign any licenses as shown above. If I then login as the admin user I can go to Exchange Online administration as shown above. I can also go to Lync Online administration, again as shown above. 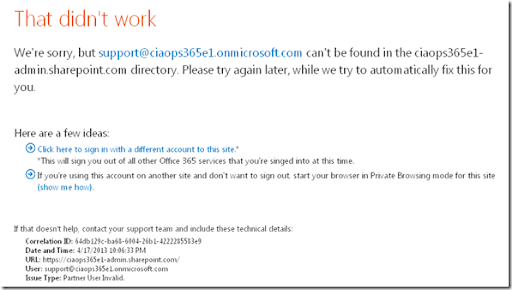 But when I go to SharePoint Online administration I see the above error. I tried to add that Tech Support user as a site collection owner and that didn’t work either. 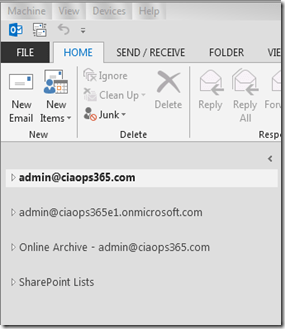 I can access SharePoint administration. 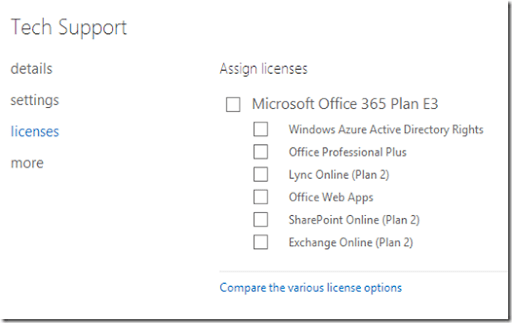 So it would seem that to administer SharePoint Online I need to assign the user a SharePoint license but I don’t have to do the same for either Exchange or Lync Online? That’s a little strange to my mind. I hope I’ve overlooked something obvious in all this. I am lucky that in my office of one I can totally control my work environment, yet am constantly attempting to strive for improved productivity. I really want to end each work day with the satisfaction that ‘I got something done’. The occasional times that I do work at someone else’s office I am stunned by how little work actually gets done. Everyone seems so ‘busy’ but nothing really gets accomplished. If you are curious about this then I recommend the following TED talk by Jason Fried. If you struggle getting ‘real work’ done every day, simply feel overwhelmed and fail to find fulfilment at the end of each work day then I commend to you the above video, book and additional information about Jason. 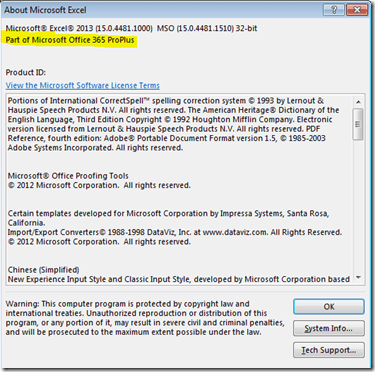 Here’s some interesting issues that I came across with Office 2013 from Office 365. What happens in the case where you have a lot of PC’s which already have a previous version of Office (say 2010 in this case) already running Outlook connected to an old email account and you want to upgrade them all to Office 2013 with the latest version of Outlook? I would have thought that the normal process you would do this via is simply to visit the downloads area in Office 365, download the Office 2013 software and upgrade the existing version on the desktop, retaining all the existing settings. At the very least I would have thought that it would have given you the option to do an upgrade or a side by side installation with the existing version of Office. Turns out from my testing that this is in fact not the case. If you have an existing version of Office (in my test case Office 2010 Pro Plus) and you install Office 2013 office 365 it automatically does a side-by-side installation, leaving the existing version in place. This now means you have two versions of Office on that desktop. Now, having two versions of most applications like Excel, Word, PowerPoint etc isn’t a big issue. The main issue is that by not doing an in place upgrade of Outlook means you have to manually re-establish the old email account and somehow migrate the emails into the new version. Not such an issue if the old account was already using Exchange, since the users mail is still stored on the server, but what about the case when the emails where POP3? All these emails are stored locally in a PST file in the OLD version of Outlook. What I did find is that when I ran the new Outlook 2013 on the desktop it automatically picked up the account settings I had in the old Outlook (which were Exchange based) and set up Outlook 2013 using these. Thus, I could easily add the new Exchange Online account from Office 365 and see both accounts as shown above. With this I could simply drag and drop emails from the old account to the new account to do a migration if I wanted (although something like migrationwiz.com makes a lot more sense for Exchange accounts). However, that doesn’t solve the problem for POP3 accounts. All you could really do is export to a PST in the old version of Outlook and then import this into Outlook 2013 and allow it to sync back to Exchange Online. It would have been nice if Office 2013 from Office 365 had offered you the choice of doing an in place upgrade simply to save you the trouble of exporting old data and deleting the older version of Office. I am sure there is a reason why it doesn’t do this but I can’t think of why myself at the moment. However, when you have lots of machines to do in a network, with frustrated users standing over you wanting access to their stuff, that can take a very long time. Now the next challenge with lots of machines is that you would appear to have to go to every machine and do the ‘click-to-run’ install of Office 2013 on each machine. Firstly, that is a lot of manual work and secondly that I believe creates a lot of downloads which can cause an issue if they are being done on multiple workstations at the same time. It would be nice to be able to download a single copy of Office 2013 from Office 365 to a network share and then use that local copy to install on all workstations rather than running a download on each workstation. Unfortunately, Office 365 uses the new streaming ‘click-to-run’ technology, which means no single download and install file. However, I believe I may have a solution. 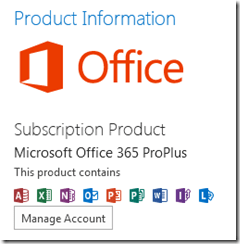 Firstly visit the following site and download a trial of Office 2013 Pro Plus as a single download to a network share. Install this trial onto all the machines on the network from the local file share. 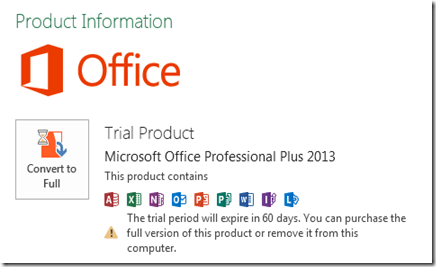 If you run an Office 2013 application now and look at the information about the product you will see that it is a trial version as shown above. Now downloading and running the installation of Office 2013 Pro Plus from Office 365 I believe that it updates the existing Office 2013 Pro Plus version it finds on the desktop so that it is licensed for Office 365. You can see this if you look at the application information again. Looking at the application information in Outlook 2013 you will see that it is not only licensed for Office 365 but you can also manage the account by pressing the Manage Account button. That button will take you to the area in Office 365 where you can manage the Office 2013 installation for that user. 1. Office 2013 from Office 365 will do an automatic side-by-side installation with previous versions of Office rather than an in place upgrade which could have ramifications for migrating accounts. 2. You should be able to install a trial version of Office 2013 Pro Plus onto a network share and then simply run the Office 2013 installation from Office 365 over the top of it to appropriately license it, thereby saving downloads and setup time. One of the things that I have seen in my travels that prevents many businesses moving to Office 365 is the fact that it didn’t allow for Public Folders. With the upgrade to the latest version (Wave 15) that is now no longer the case I have posted about previously. So being conservative, that is 1GB of email storage for public folders that’s included with Exchange Online! If you also combine that with 7GB for each SharePoint Online user with SkyDrive Pro, you would have to admit that is extremely generous. Let me put that into context. The biggest public folder hierarchy that I have ever seen was 600GB and growing at 300MB per month! Aside from the fact of getting that up to the cloud, Office 365 could EASILY accommodate even that capacity! If you could get it all up there you’d probably never have to worry about buying additional storage space (which I know the business struggles with daily on premise). Most public folder arrangements I see are much less that the 600GB monster I mentioned above, so really (bandwidth aside) there is now no good reason not to consider moving public folders to the cloud with Exchange Online. It would probably also be a good opportunity to do some spring cleaning on them as well to reduce the bloat! With all the storage options on Office 365 there’s a solution for most situations, but don’t retire your old file server just yet. If you have applications on-premises that require local access to shared file storage… think Autocad or a document management system that ties in to a large format printer… you’ll still want some network attached storage (NAS) or an actual file server. You can supplement that file storage using these methods though and use a tiered storage plan. Maybe you keep large binary files (ISOs, software install packages, etc.) on your file server, your documents on SharePoint and personal files on SkyDrive (instead of your network My Documents). I point this out to highlight that Microsoft UNDERSTANDS that some stuff should stay on-premise. As the heading for that sections says – THE RIGHT TOOL FOR THE RIGHT JOB! I say this as I believe much of the Microsoft cloud message has been mis-represented and interpreted as the ‘Cloud or nothing’. That, in fact is the catch cry of many other cloud providers, irrespective of what actually works best for the user. The right approach for the moment is hybrid. Microsoft understands and, to my knowledge, is the only supplier that provides that option. If you think otherwise, the above quote illustrates that you maybe mistaken.